This easy Tomato Basil Riced Cauliflower skillet combines the frozen riced cauliflower with the fresh flavors of tomato and basil for a perfect dish in only 15 minutes. In 10-inch covered skillet, heat oil over medium-high heat. 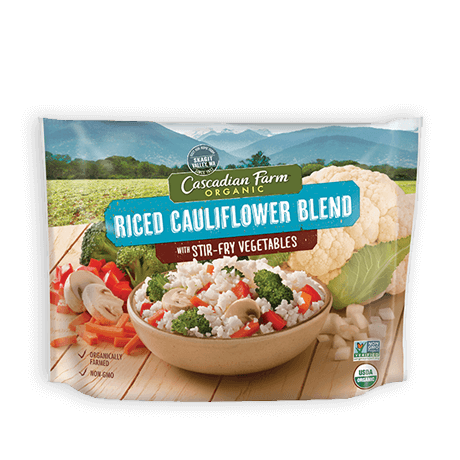 Add frozen cauliflower blend; stir. Reduce heat to medium. Cover; cook 7 minutes, stirring frequently. Stir in garlic and salt; cook uncovered 1 to 3 minutes or until cauliflower is tender. Remove from heat; stir in tomatoes and cheese. Let stand 1 minute. Can substitute a cup of chopped fresh tomatoes for the grape tomatoes. Combine with cooked shrimp or chicken for a quick meal.